Based on the best-selling business book Traction: Get a Grip on Your Business, by Geno Wickman. The EOS® process and framework gives you the structure you have been looking for. Many of our CEOs come to us with issues such as “How do I hold my senior team accountable for our goals and objectives?” or “Our meetings are all me talking and nobody listening” or “I just can’t find the right people.” Sound familiar? What if instead of having to come up with all the answers, you could adopt the same proven framework used by thousands of successful companies? 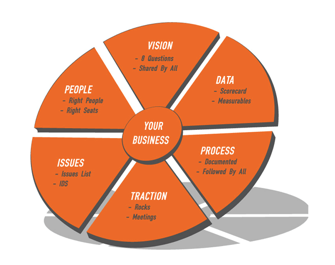 Part of our process includes building the framework with your management team, identifying the 3 to 8 metrics that drive your business, documenting the critical processes in your company. You can read the book and do it on your own. Some of the tools are free. We have a place you can even download the public tools. You can use a “Certified Implementor” like BrewerLeadership to help you on the journey to mastering the EOS framework. Why? Because we have done it before. We make the stand for EOS Best Practices. We facilitate the full day offsites. We make it fit your company. No learning curve. Guaranteed results. You are thinking: What does that cost? What do we have to do? What commitments do I make? What results can I expect? That is covered in a free 90-minute meeting for the executive leadership of your company. That session is valuable even if you decide EOS® is for you, but you think you can go it alone. No obligation. Click below to schedule a call to set up your 90-minute meeting.